Zendesk Support puts all customer interactions in one dynamic, user-friendly interface for an efficient, seamless process. You can bring in customer queries from almost any channel via pre-defined ticket responses, web widgets, and customer search history, allowing you to respond faster and with the right context. The main customer service support module can also be customized to fit your customer service workflows or apps that you’re already using. 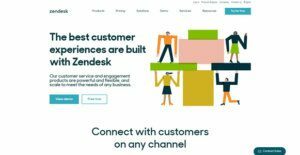 It also features customer satisfaction ratings and analytics via performance reports and dashboards, which elevate Zendesk’s service desk management solution to another level. Its Help Desk lets you develop institutional knowledge culled by your support team over the years, while the Zendesk Guide module helps you build a help center, online community and customer portal. You can direct FAQs and low-touch tickets to this portal, while your agents deal with high-value customers and sales leads. An AI Answered Bot can also direct queries to relevant articles in your base, squeezing out more ROI off your content marketing budget. The robust service management automation tools of Zendesk Support help solve routine issues quicker using macros and enable IT teams to easily manage service requests, issues, events, and incidents. These tools allow tagging of issues for more efficient reporting, categorization, and monitoring across tickets. By integrating with popular IT asset management tools, Zendesk Support tools allow better monitoring of monitors, computers, phones, and other job devices. Each organization has different requirements and needs a system that can be customized for their size, type of staff members and clients, and the specific industry they are in. For these reasons, no system can offer perfect functionality out-of-the-box. When you look for a software product, first be sure what you need it for. Read some Zendesk reviews and ask yourself do you want basic tools or do you require advanced features? Are there any industry-specific functionalities that you are searching for? Obtain the answers to these questions to aid your search. There are plenty of factors that you need to consider and these include your finances, specific business requirements, your organization size, integration needs etc. Take your time, use a few free trials, and finally zero in on the app that presents all that you need to boost your organization effectiveness and productivity. We realize that when you make a decision to buy Service Desk Software it’s important not only to see how experts evaluate it in their reviews, but also to find out if the real people and companies that buy it are actually satisfied with the product. That’s why we’ve created our behavior-based Customer Satisfaction Algorithm™ that gathers customer reviews, comments and Zendesk reviews across a wide range of social media sites. The data is then presented in an easy to digest form showing how many people had positive and negative experience with Zendesk. With that information at hand you should be equipped to make an informed buying decision that you won’t regret.